There was no panic in the cafe. Japan, sitting on the pacific ring of fire, sees over 1,500 earthquakes a year and judging by the calm with coffee, the country’s citizens are used to them. We felt one more earthquake before leaving Tokyo. A day at the Museum of Emerging Science confirmed both. 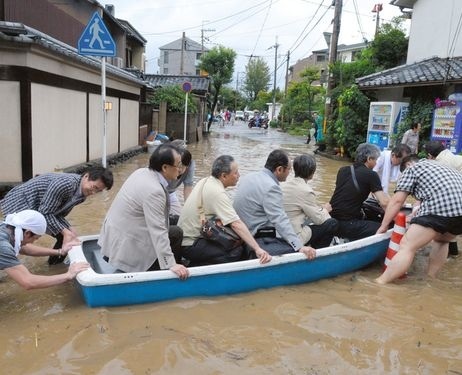 We packed up, headed to Kyoto and…walked into a typhoon. As tourists, reality is often suspended. There’s the vacation protection bubble myth, that bodily harm couldn’t possibly happen in paradise. So the zipline company doesn’t provide helmets, so what? So the taxi has no seat belts, big deal! Despite a sleepless night listening to house shuddering wind and rain. Despite my cellphone, now on Japanese wifi, shrieking hourly with emergency warnings (ok, in my defense, the alerts were in kanji, Japanese characters), I wasn’t concerned. When Kyle told me the next morning that he attributed the cellphone noise to neighbors ringing our doorbell trying to alert us, I at least wasn’t alone in my moronic choice of sleep over emergency response. At some point, we actually read the news and were mortified to learn that over 250,000 people were evacuated not 15 minutes from us. But it was really this morning, when we made our way to Arashiyama, on the NE outskirts of Kyoto, that we realized we’d missed reality. 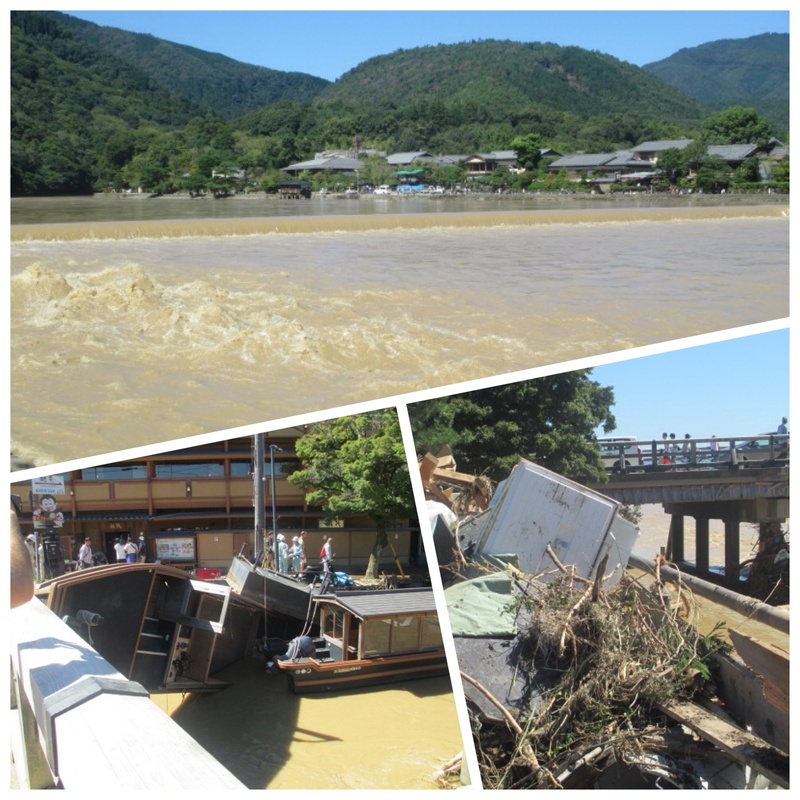 The Katsura River flooded, nearly submerging the historic Togetsukyo Bridge, and damaging the shops, restaurants and inns along the river. It’s slightly embarrassing now to admit that we had come to Arashiyama as giddy tourists to see the monkey park. Instead we saw a raging river, piles of debris, and flooded businesses with groups of people working hard to clean and recover. Now a profound ending would be to say that we too jumped in, rolled up our sleeves and helped. We didn’t. We talked about it, assessed the situation (the press and military were on site) and determined we’d be a distraction vs a help. Instead, we climbed small roads high above the river and visited a Buddhist temple, Otagi Nenbutsuji. There we were surrounded with 1200 rakan, stone statues representing Buddhist disciples. While built in the 8th century, the temple was hit with a…yes…typhoon in 1950 and had to be rebuilt. 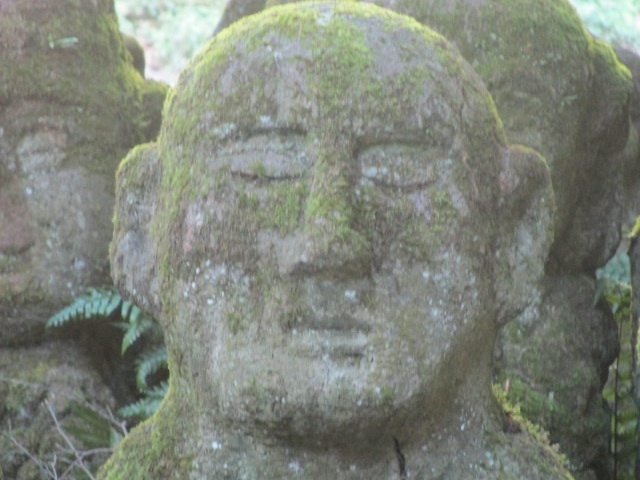 The rakans were thus carved in 1980s and 1990s by amateur artists. 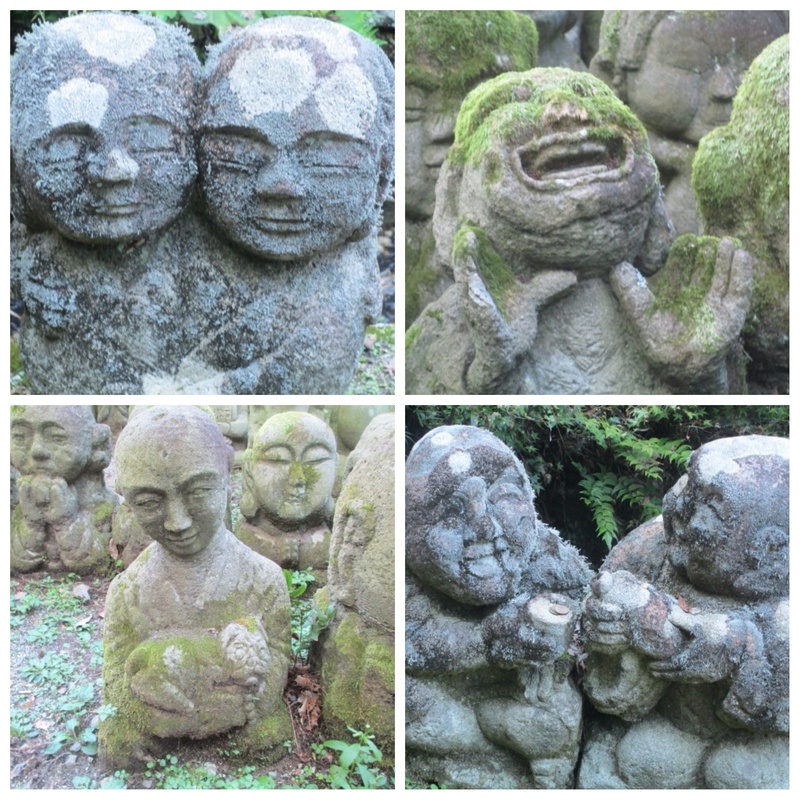 The temple brochure reads that “…the carvings have amusing or contented expressions that warm the hearts of visitors.” And that’s exactly what they did. Here in our suspended reality, we’d come face to face with a surreal location that had been destroyed by natural disaster and rebuilt with calm and steady resolve. As we peered into the faces of each rakan, smiling at some, laughing aloud at others, it was clear to me what an exceptional culture we were experiencing. So imagine our surprise when we saw among the many faces, the one person in our extended family who epitomizes calm, steady philosophical resolve, who is hard working and driven by “we” vs “me.” And who certainly would have recognized a natural disaster just a wee bit quicker than we did. Thaank you so much for sharing the rakans! What an experience it must have been to have seen tnem “in person” & what a blessing that you’re all safe. Uncle Don & I are having a GREAT vicarious adventure! I understand your sense of being suspended as a tourist. We are in many ways protected from the realities of citizens until tragically we are not. So relieved this was not one of those times. Keep posting. I love your perspective on it all – the good, the bad and the ugly! Tell the kids their POV rocks. The adventure is out of the gates adventure. Well done! I will tell the kids, Lisa! Hope the school year re-entry is going well for Flora and Kai! Yes, welcome to earthquake land! Great, juicy post. You tell a story very well. Cheers! Thank you, Jennnifer! I love your heart writer blog and http://www.mamaneedsarefill.com because lord do I always need a refill!